The overall fit of this jacket is very “standard”. We checked some sizes against Joe Rocket’s size chart and found the estimated chest sizes to be accurate. We also tried on a Medium and XL on our Fit Check mannequins Huey and Dewey and they look great (view those shots by taking the View Larger Images link above). Therefore, I recommend you choose the size jacket you normally wear in men’s clothing. You can use the chart to choose if you know your chest size. This jacket has a wide range of adjustment through the mid-section. There are two side adjusters that work well. In their wide-open position, they will allow for a roomy belly, but they can also be snugged up by several inches for flat bellies. “Talls” are available in black. The tall sizes add 1” to 1 1/2” to the sleeve length and body length. Joe Rocket’s jackets tend to be very consistent from one model to the next, so if you’ve owned or have tried on another model and found a fit, you’ll have a great shot at finding the same fit in the same size here. The Atomic 5.0 gives a styling update to Joe Rocket’s “go to” sport textile jacket. We are at the fifth revision of the jacket now. I’m not sure how long the Atomic has been part of the lineup, but I’m guessing a dozen years? Good value has been the thing that I’ve always liked about the Atomic jackets. They have all had all the essential features that nearly any street rider would wish they had, and all for a relatively low price. And overall it is still high in my opinion, even though the basic price of the jacket hasn’t risen significantly in a long time. Styling is updated and in my opinion is a more “modern” design with the waterproof zippers and all that are neatly integrated into the fabric. There is a mix of textures with the heavier textile material over the shoulders and elbows, and the selection of colors is very good… something for everyone. The shell of this jacket is waterproof… the material doesn’t allow water through and the seams are “taped” on the back side to prevent leaks. This type of construction should be about a 95% solution for most wet weather conditions. The various zippered vents are waterproof styles and there is a LARGE double closure flap in front to prevent water entrance through the main zipper. I note that the short sleeve end zippers are not waterproof, so you’ll want to wear gauntlet gloves over the sleeve ends if possible. The advantage to a waterproof shell with zippered vents like this is that you do get full flow of air through the shell all the way to your skin with the zip vents open. And you don’t have to fuss with putting in or taking out a liner for wet weather. Other setups require the installation of a waterproof liner OR they have a permanent “mid liner” which won’t allow the same air flow through. So even though you may have some minor leaks, you’ll appreciate the convenience and the comfort in warmer weather that this setup gives. 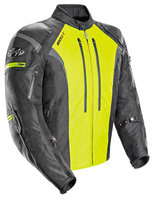 For cold weather use, the jacket includes a full sleeve thermal liner which feels like it will work well. A couple features are added that you don’t see often… this jacket has a built in fanny pack in back over the kidney padding, and for ease of movement, there are large flex panels built in behind each shoulder. Venting is a big deal in this new version too. Take a look at our close-up pictures of this model and you’ll see how the two large front torso vents can be buttoned together to create two large intake scoops. Joe Rocket calls this the “Cross Linked Ventilation” setup. It is really a good idea… works well and is without complication or fuss. In addition to the two front zips, there are smaller bicep vents and two large rear exhaust vents.